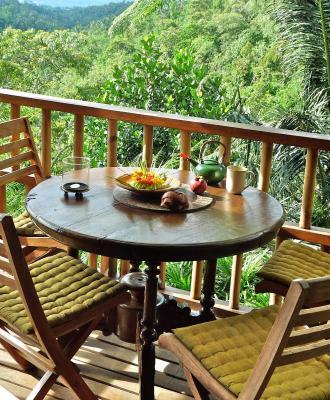 Lock in a great price for Sarinbuana Eco Lodge – rated 9 by recent guests! 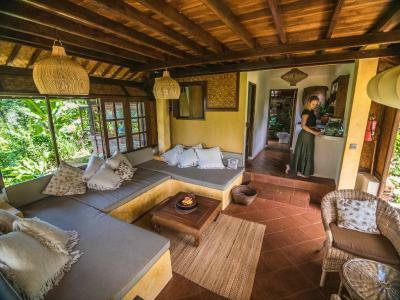 Rooms have all the basics and have beautiful outlook, vegan food at the restaurant was delicious, we did a number of the activities provided by the lodge and enjoyed them. Transfer from the airport was smooth and the driver even stopped to let us buy some fruit. The lodge grounds are well maintained and relaxing and its impressive what they have setup over the years. Downhill bike ride was one of the highlights of our stay. Massage was excellent. 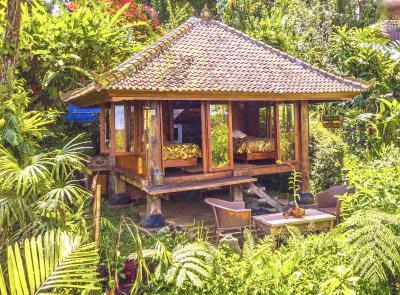 Overall, its an excellent and unique accommodation that could be improved even more in time. Great location off the tourist trail, amazing views and wildlife. The owners and staff made us feel welcome and at home, and the food was excellent. Love the contribution to the local community and the environment that this business has made and is making, well done! Beautiful views and the food was nice. Friendly staff. 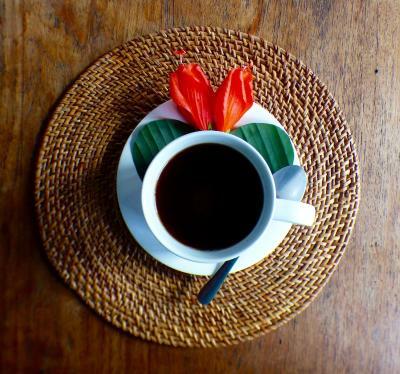 Every good things from walking back in the morning, it is a big green garden with lots and lots tree, birds, flowers......the breakfast is natural and yummy, when you stay here, just feel free with neighbor. Sometime there are spiders or insects on the bed, very ecological but i do not mind this, it really don't know how to prevent, just be a friend with these little guys. A great place in my mind. Thanks for staffs who service my room orchid bugalow ;-). Location was incredible with plenty of birds and reptiles. 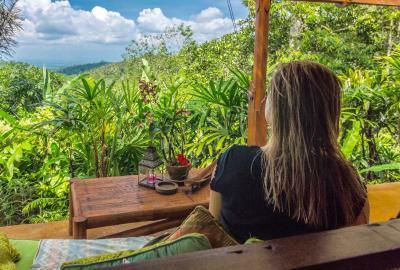 The location is incredible, you wake up in the morning surrounded by green and sounds of the jungle, adding the amazing view from your bed (! ), it’s truly a magical place. 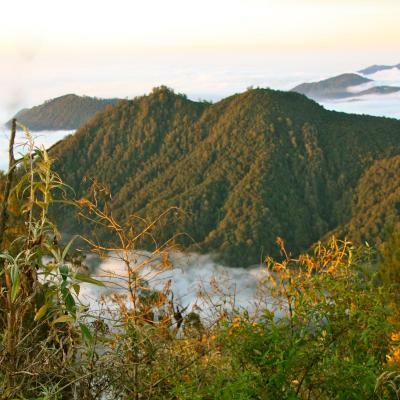 The yoga teacher made sure we could follow the class even though we were first timers and Tommy gave us a enjoyable and informative trekking tour and answered all our questions about local flora, fauna and traditions. This place is a real gem im really glad I found it. it was just what I needed on my trip. 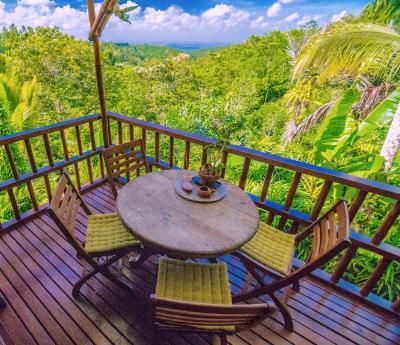 stunning views nestled in gorgeous jungle with clean water, quiet no tourists or commerce. I stayed in different rooms, some better than others, very basic. The staff are delightful and a real pleasure to be around them. seems like there is plenty of stuff to do there too although I kept mostly to myself just enjoying the natural peace and tranquility, yoga was great!! 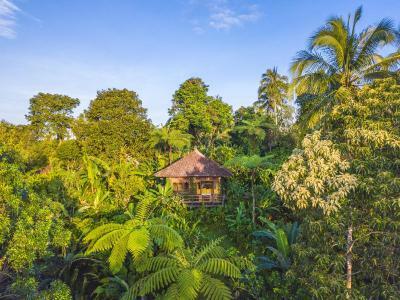 Sarinbuana Eco Lodge This rating is a reflection of how the property compares to the industry standard when it comes to price, facilities and services available. It's based on a self-evaluation by the property. Use this rating to help choose your stay! Offering a natural river and views of the mountain, Sarinbuana Eco Lodge is located on the remote slopes of Mount Batukaru in Blimbing, Central Bali. 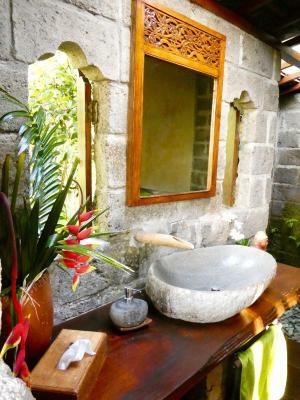 The property is approximately a 2-hour drive from Denpasar. 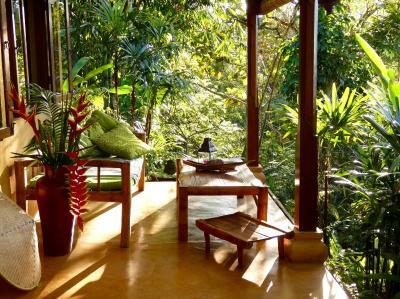 Enjoying expansive views of the garden, certain rooms have a terrace or a balcony with a seating area. 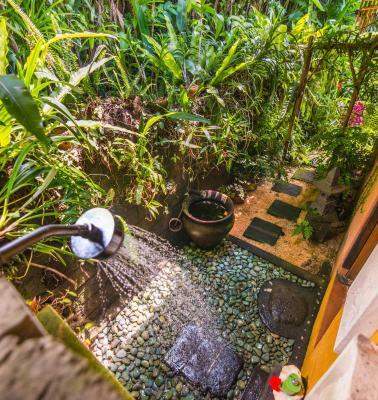 All rooms have a private bathroom. There's a gift shop at the property. 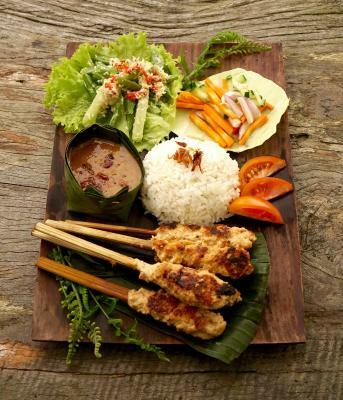 The restaurant serves meals made from the produce of the property's organic garden. 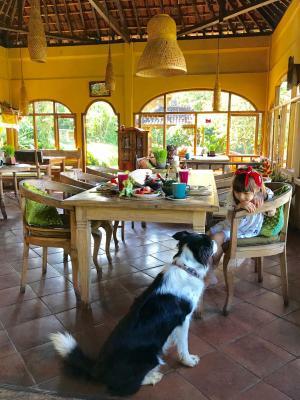 Bike hire is available at this guest house and the area is popular for hiking. 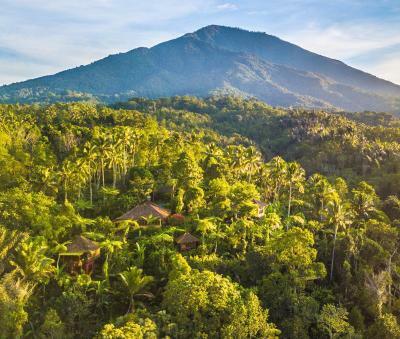 Ubud is 15 mi from Sarinbuana Eco Lodge, while Seminyak is 22 mi away. 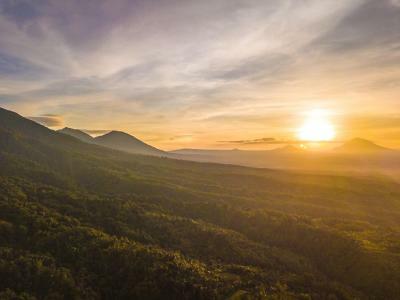 The nearest airport is Ngurah Rai International Airport, 25 mi from the property. This property is also rated for the best value in Blimbing! Guests are getting more for their money when compared to other properties in this city. 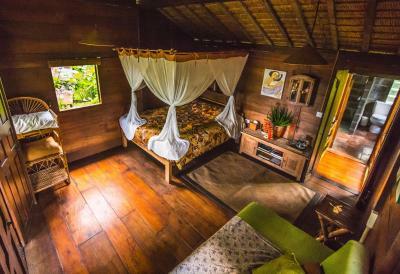 When would you like to stay at Sarinbuana Eco Lodge? 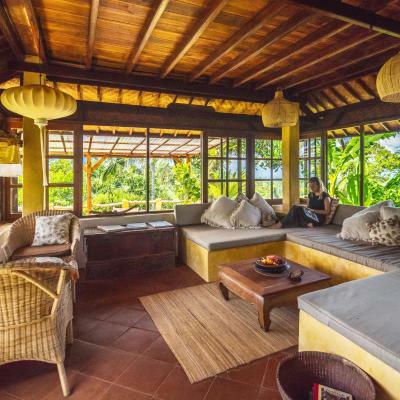 This villa has a balcony, a sofa and an outdoor seating area. 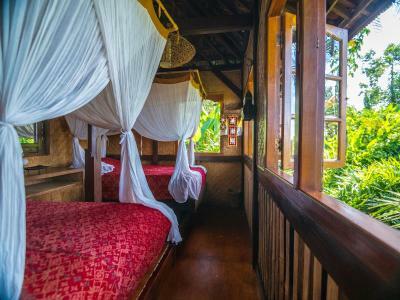 House Rules Sarinbuana Eco Lodge takes special requests – add in the next step! 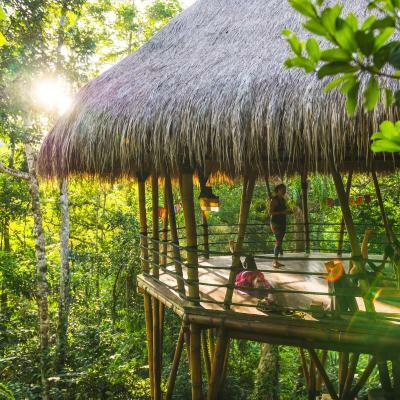 Sarinbuana Eco Lodge accepts these cards and reserves the right to temporarily hold an amount prior to arrival. Please note that a 50% deposit is required to secure your booking. The property will contact you directly to provide payment instructions. 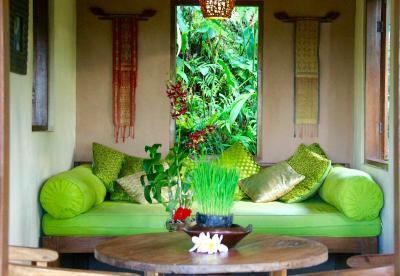 The property offers hotel transfer from all areas of Bali. If you wish to use the service, please inform the property 24 hours in advance. Please inform Sarinbuana Eco Lodge of your expected arrival time in advance. You can use the Special Requests box when booking, or contact the property directly using the contact details in your confirmation. The villas were a long walk down a steep path. The paths around the property were uneven and had lots of steps which were not lit at night. Solar lights along the path would be helpful. The villas were a bit run down. Doors and windows did not shut properly. The villa was not very clean and the sheets were stained. The swimming hole was a long steep walk down many steps and then it was muddy. There were many mosquitoes as well as slugs and spiders in the bathroom and ants in the lounge room. 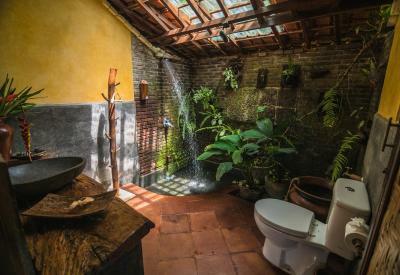 Even though it is an eco lodge we did not expect this. We enjoyed the carving and massages but there was not a lot else to do. You would not want to stay more than a few days. 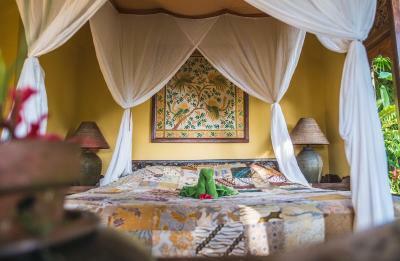 It was also disappointing that there were no yoga classes on during our stay. Perhaps the fact that we needed to decide what to eat next. Cooking lesson - we were also charged for the food later at the regular menu price - first time I’ve ever experienced that. 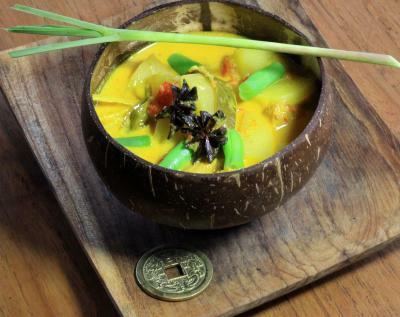 Usually if you do a cooking lesson in my experience you get to eat what you’ve made included in the price of the lesson , so it all ended up as quite pricey. Website needs updating a little bit as there are no rabbits any more. If you have kids, this might be important! The manger was either run ragged or just didn't value the guests as once we had planned activities for the remaining time at the lodge, the facade of friendliness disappeared, and we didn't even get acknowledged upon departure at checkout, i'm not expecting much but a little common courtesy goes a long way. Manager also didn't mention NYE banquet cost until checkout, which was considerable. We had no hot water for our shower despite reporting it to lodge staff (it didn't really bother us, its Indonesia), the cooking class is a little bizarre in that you pay to make your own meal and then have to pay for it again in the restaurant, please vacuum seal your coffee beans in the gift shop as i would have loved to take some home. The binder in the bungalow is information overload and important information needs to be highlighted. Unfortunately the Eco message and lifestyle stops abruptly at bars of the caged monkeys, and rabbit housed in less than adequate condition in small, drab cages. The monkeys need to be moved to sanctuary to live out the rest of their lives. Was put into too hard basket by owner when discussed. 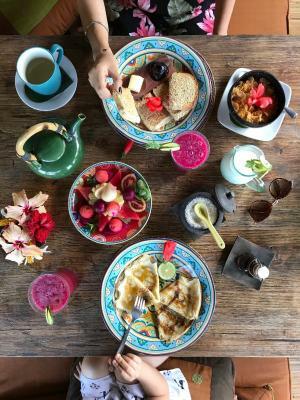 The food is good, not the best ive had in Bali and is very expensive and there are no other options in the area to eat, so expect meals to be 2-3 times more expensive than the really good warungs and health cafes in Ubud. 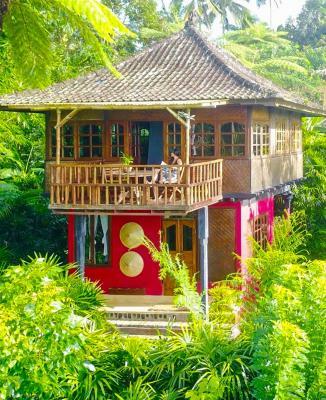 I would have stayed longer but its priced for short stays and that also means many of the guests are noisy tourists not really tuning into the land and the peace thats there. yoga mats are pretty gross, old, warn and dirty, suggest bring your own. Everything! Reunion with nature physically and spiritually. 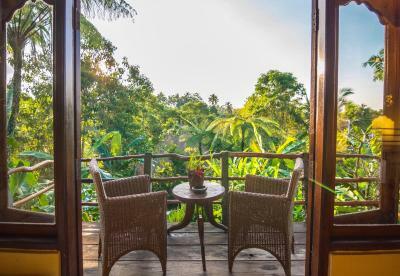 Quiet and peaceful, fantastic view from balcony of private bungalow, super tasty food right from the garden, yoga and waterhole, fish pond and massages, workshops and bike tour to rice terraces! Owners and stuff are super pleasant and make you feel like home so you will not want to leave. Perfect place for those who tired of cities, noise and tourists around. 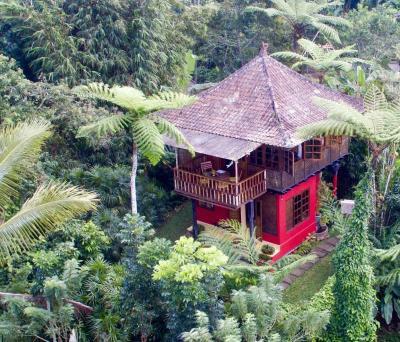 me, my partner and his parents took the family tree house, which has an awesome view, especially from the top floor. the food was delicious and they have vegan options. for breakfast we could get scrambled tofu, even if it was not on the menu. the staff is very friendly and they offer a free garden tour which is very interesting. 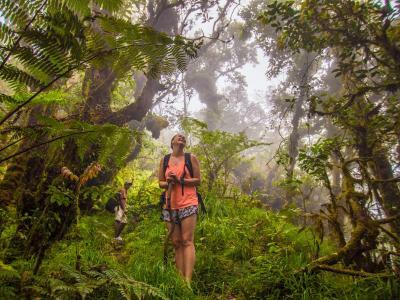 also they offer many different trekking tours, we did the 5 hours rain forest tour. 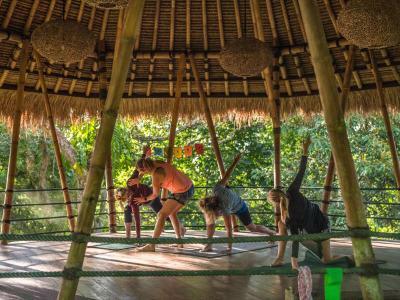 every morning at 7 am and in the afternoon at 4 pm they offer free yoga, which was great with a very nice yoga teacher and the yoga cottage is great in the middle of the jungle, like the whole resort. i would def recommend and come here again. Be careful when going for a walk around the neighbourhood. There are some really agressive dogs that are quite territorial and look like they could attack any moment. I would recommend only walking around with a guide. The view from the lodge was absolutely amazing! I wish I could have stayed at this place longer. 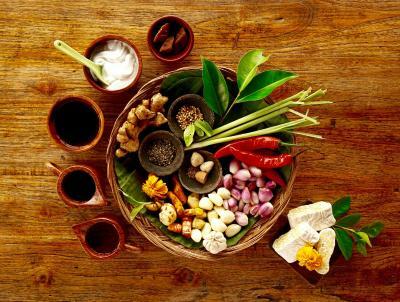 The food was delicious, the massages were amazing and staff were extremely friendly and very accommodating with our requests. I'm so happy I found this place and I've been recommending it to all my friends. I'll definately be back some day! I also really enjoyed the yoga class in the morning! 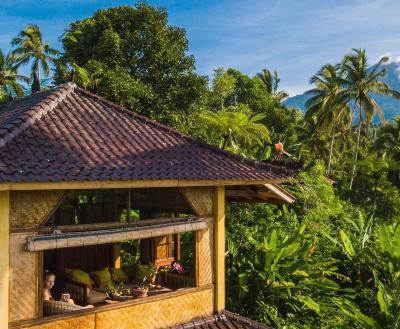 As it was eco-lodge it was priding with eco-attitude and it indeed could be seen and tasted (super nice food from local ingredients) everywhere but they kept monkeys as 'pets' which didn't really go with the rest of the ideology. We were sad to see it wondering who were they there for and why. 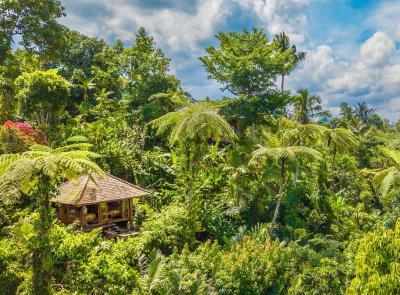 Amazing place in a rain forest with a stunning view. 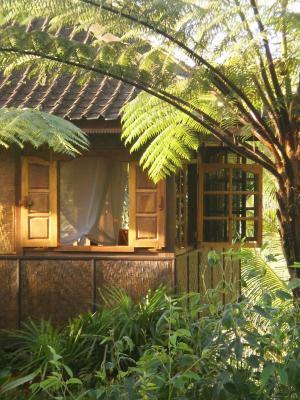 We stayed in the cozy bungalow which was their most basic room type and loved it - others should be even more amazing. Food was really good and the restaurant really cozy. We stayed there often at night to play board games as our bungalow didn't really have a living room but it worked perfectly. Difficult to get there. Take their pickup service if you want to be safe. Eco friendly, remote place. Yoga in the morning in an amazing location (too bad we were sick). 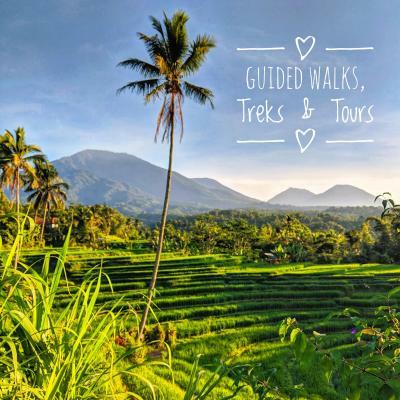 Great walks and activities if you want. Great kitchen with local options every evening. 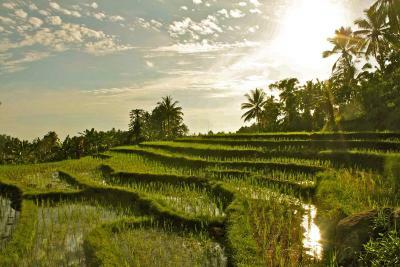 As for the transport service to Ubud, he was the best driver we had in Bali.